This Seared Scallops with Sesame Salad Greens is a beautiful salad that can be served as a side dish or a main course. 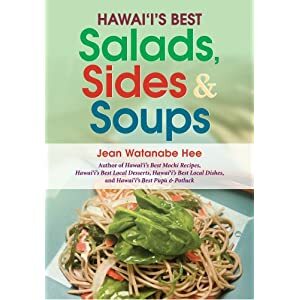 Order Hawaii's Best Salads, Sides & Soups Cookbook - What meal would be complete with out a side dish to accompany the entree? Take the guess work out of what to prepare with dinner with Hawaii's Best Salads, Sides & Soups, a collection of over 100 recipes for hearty and nutritious salads, savory soups and tasty side dishes. Find recipes for everything from classic Chicken Noodle Soup to the exotic Lemongrass Tofu to the fun and eye-catching Jell-O Fruit salad. To prepare the scallops, season lightly with salt & pepper, then toss in a small bowl with a large drizzle of sesame dressing. Heat a large pan on medium high and add the canola oil. Sear the scallops for about 3-1/2 minutes each side, being careful not to crowd them in the pan so they brown nicely. Set aside to cool. Toss the remaining salad ingredients together and lightly season with the dressing. Don’t over dress. Serve with desired condiments and a few scallops.